Choose the referral message option that fits you! Use the tools and messages below to leverage your social networks and spread the word about what XYZ Trucking offers employees. Remember to encourage candidates to say you sent them to make sure you get your referral bonuses. Just send one of the messages below to your social network or to friends via email. Tip #1: Adding a personal comment is great! I work at XYZ Trucking and I want to pass along that we’re hiring. So if you’re looking for work that has value, good compensation, and the opportunity to be part of a great team, check us out! Visit www.xyztrucking.com or contact us at hr@xyztrucking.com // 111-111-1111 and please tell them I sent you! Contact us today! We’re hiring at XYZ Trucking! If you’re looking for meaningful work with flexible schedules and opportunities for advancement, visit www.xyztrucking.com or contact us at hr@xyztrucking.com // 111-111-1111. And say I sent you! There are job openings at XYZ Trucking right now! Working with XYZ Trucking has been great for me. If you’re looking for meaningful work with flexible schedules and a good wage, visit www.xyztrucking.com or contact us at hr@xyztrucking.com // 111-111-1111. Be sure to say I sent you! Choose one of the example messages below and plug in the benefits from the list at right that most resonate with you. Then add any comments you think will enhance the recommendation. When you’re done, share with your social network or email to your friends. My job at XYZ Trucking offers me holiday paygreat compensationholiday paysteady hoursmeaningful work , holiday paygreat compensationholiday paysteady hoursmeaningful work , and holiday paygreat compensationholiday paysteady hoursmeaningful work . If you’re looking for work that has value, good compensation, and an opportunity to be part of a great team, check us out, we’re hiring! Visit www.xyztrucking.com or contact us at hr@xyztrucking.com // 111-111-1111 and tell them I sent you! There are job openings at XYZ Trucking right now! Working with XYZ Trucking has been great for me. I especially like the quality time I get to spend at homehaving practical milesthe great benefitsthe holiday paygetting a reliable paycheck . If you’re looking for meaningful work with flexible schedules and a good wage, visit www.xyztrucking.com or contact us at hr@xyztrucking.com // 111-111-1111. Be sure to say I sent you! Please share your story re: why working with XYZ Trucking has been good for you. Write a brief testimonial to share on your social networks or to email to friends. Please include each of the parts below. I’ve learned skills at XYZ Trucking that I can use in other areas of life, and I’ve had the opportunity to grow professionally and personally. This is a job that makes me feel good - we help people, provide quality services, and we work as a real team. I like that! You could be working here too; we’re hiring. Take a look at our site www.xyztrucking.com or contact us at hr@xyztrucking.com // 111-111-1111 to find out how you can join our team! And tell them I sent you! I've always loved staying organized and now as a Logistic Specialist at XYZ Trucking, I'm getting paid for it! Here, I feel like my work matters and I get to be apart of an amazing team. Sound good? You could be working here too; we’re hiring. Take a look at our site www.xyztrucking.com or contact us at hr@xyztrucking.com // 111-111-1111 to find out how you can join our team! And tell them I sent you! We’ve created a short message for Twitter. Just post to your Twitter feed. XYZ Trucking is hiring! Visit www.xyztrucking.com and don't forget to say I sent you! I work at XYZ Trucking and I want to pass along that we’re hiring. Email us at hr@xyztrucking.com and say I sent you! 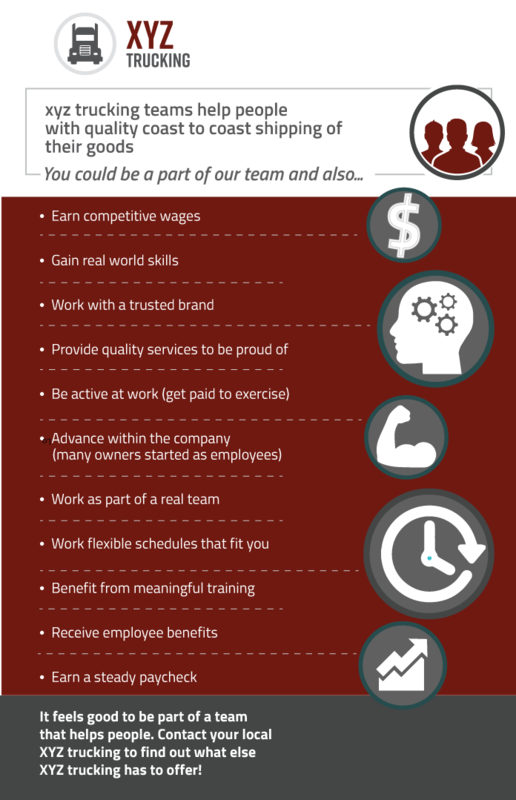 We’ve created infographics explaining employment benefits at XYZ Trucking. There is one for driving jobs and one for logistic jobs. Just post the infographic to your social network. Put Your Hiring Video Here! If you have a hiring video, you can add it here for your employees to share!